This year again, Gebrüder Thonet Vienna GmbH (GTV) confirms the profound vocation for design research through the creative insights of designers who have made research one of the hallmarks of their artistic journey. The proposals for Salone del Mobile 2017 will explore different refined stylistic and aesthetic views, inextricably linked to curved wood, the element that represents the passion and soul of the company. The constant commitment to research and identifying new roads have led the company to work this year with a heterogeneous group of designers in the search for new traits and expressions of contemporary design. Preferring a choice against the trend respect to the classical aesthetics of the company, but nevertheless remaining delicate and casual, the design of the new Chignon chair by Lucidi Pevere offers balance between softness and lightness with a veiled retro note. 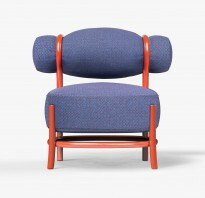 The entirely bent wood structure is designed for enveloping and containing the sinuosity of the chair, acting as a support for the comfortable and voluminous seat and for the soft and fun seatback, brought together by two beech wood curls – GTV’s formal stylistic element par excellence – precisely like a form of hairstyle. The result is a deliberately feminine armchair that is not slender and filiform but shapely and curvilinear, characterised by a strongly iconic presence, suitable for giving character to a domestic space but also for creating relaxing environments in a contract context.